As I’ve been processing this difficult place in life where God seems silent, mountains seem immovable, and the course is challenging, God has brought back to my mind the words of Psalm 66:10-12. You refined us like silver. and laid burdens on our backs. I shared these verses with my husband as we talked about the mire we feel like we’re struggling to walk through in life right now. Even though our literal circumstances may differ from his, the Psalmist certainly hits on how we feel in our trials — imprisoned, carrying heavy burdens, trampled upon, enslaved, surrounded by intensity, treading through deep water. Yeah, I’d say that about sums it up. This Psalm speaks of the Refiner’s fire, so I did some searching on the process for refining precious metals in order to increase my understanding. I was blown away by the parallels. I’ll share just a few from what I learned. Step 1: Breaking — The refiner had to break apart the natural ore, which is the chunk of all the metals mixed together, containing the silver. If the ore wasn’t broken, the refiner would not be able to see inside to what precious metals were contained. And he would never be able to remove the lesser metals and refine the precious metals into their desirable pure form. Maybe in my brokenness, God is looking inside of me to see what beautiful qualities he wants to bring to the front of my person. Breaking is necessary in the refinement process. It must happen. If God wants to refine me, then he must first allow me to be broken. But he always has the greater good in sight. He won’t allow me to be broken simply for the sake of breaking. The breaking is for a greater purpose. 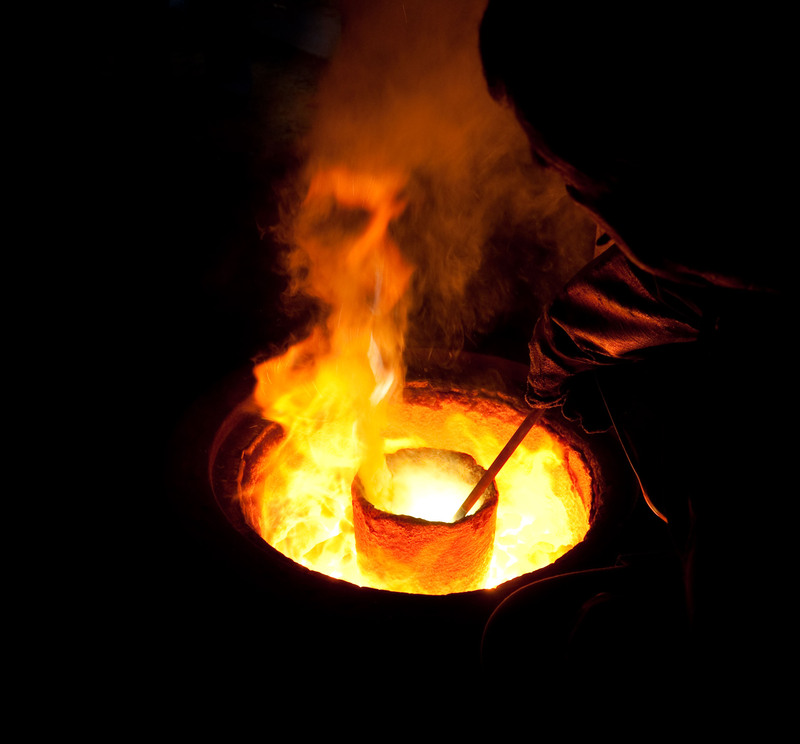 Step 2: The Crucible — The refiner would then place the chunk of ore into a fireproof melting pot called a crucible. This crucible was placed inside a fiery furnace where the ore would begin to melt so that the impurities could be removed. As the ore heated within the crucible in the fiery furnace, a layer called the dross rose to the top; these were the imperfections that the refiner was trying to remove. I can definitely identify with the image of life being one giant fire-cooker. It’s too much; it’s too intense. But the heat is needed. Without it, the impurities can’t come to the surface in order for the Refiner to remove them. And isn’t that the truth… Nothing makes our true colors show like a little bit of heat and pressure. I see God looking down at me as my impurities surface left and right, saying, “Aha, yes, there it is. Let me just get that out of you.” As the heat of suffering increases, God has more and more opportunity to remove the lesser qualities that I possess. Step 3: The Purification — After the refiner scraped off the layer of dross, get this, guys, he put the ore back into the fiery furnace again! And he raised the heat! Because new layers of dross arose each time the ore was heated to certain temperatures. More and more impurities came to the surface and the refiner could remove them. Over this process, he gradually purified the ore until he had only the precious metal that he desired. History tells us that refiners could put the ore back in the furnace up to seven times to complete the purification. Some days, some seasons, I feel like I’ve had all the fiery furnace I can take. And the heat just pours on anyways. I have shaken my figurative fists and cried out “Enough! It’s enough!” I’ve probably done it literally too. I feel like I’ve had all I can take, and then God allows more trials to pour into my life, raising the heat a few more degrees. It’s the refiner’s fire. He puts me right back into that fiery furnace and turns the heat up even more, because he wants those impurities out. Step 4: The Reflection — I love this part. Do you know what the refiner was looking for as he removed each layer of dross and surveyed the molten metal inside the crucible? He was looking for his reflection. Once he could see his reflection in the pool of melted metal, he knew that the purification was complete. Our Refiner is looking for his reflection, too. He is purifying us so that he might see his reflection more clearly in our hearts and lives. Our trials give us an opportunity, if we choose to accept it, to grow in the qualities which reflect God’s heart. They give us an opportunity to have more of our impurities removed so that we look more like Jesus. Understanding what the Psalmist was referring to in those few words about the refiner helped me take a completely new look at my trials. Yes, they are hard. Yes, they are burdensome. But they are not without purpose. They are not wasted. Perhaps I have forgotten in this season of life that I serve a God who wastes nothing. One of my favorite components of the miraculous feeding of the 5,000 in the gospels is that after the supper Jesus instructs his disciples “Gather the pieces that are left over. Let nothing be wasted” (John 6:12). Let nothing be wasted. Jesus wastes nothing. No one. No trial. No broken heart. No burden. Nothing. It is all useful to him. In addition, the final promise of this Psalm also restores my hope. Although the people of Israel went through many trials, the Psalmist remembers of the Lord, “you brought us to a place of abundance.” A place of abundance. All that Israel went through, which was so, so terrible, ended with a fulfillment of God’s promise, a place of abundance. Although my life has felt like the crucible for God’s refinement lately, I know that he is bringing me to a place of abundance. I know that my God keeps his promises. And I pray with all my heart that he will see his reflection as he gazes into my heart and into my life, not just so that I can get out of this hot hole, but because I want him to be pleased with me. If I can look more like Jesus because of all this fire in my life, then it’s all worth it. I can’t waste that opportunity in anger and depression and fear and worry. That’s not the purpose for my trials. I can’t sit in that if I want to look more like Jesus. I want to say that it’s time for me to get up and do something about myself, but the other truly beautiful part of the refining process is that the metal does nothing but sit there, while the refiner scrapes off the dross. So I will sit here, and I will open my heart to my Refiner, and I will ask him to remove that dross. I want a heart beat again. WOWSERS, Catherine!!!! Rarely anymore do I read anything that really gets through to me, really speaks to me right where I’m at. And YOU DO! I cannot even begin to tell you how powerful this is in my life right now! In so many ways. In restoring some hope, in revealing to me “How much am I really wanting to look like Jesus anymore?” And unfortunately the answer to that question, honestly, has been not very much. That has not been my main focus. Feeling so beaten down by trial after trial after trial with no relief in sight, looking like Jesus has not been my foremost goal. It has been hard to get beyond the “survival mode,” and lately I haven’t been able to really see that there is more to all this than my just being constantly more broken. I have not really cared that much about looking more like Him. Nor have I been able to realize that HE STILL DOES, even if I no longer do! :/ Thank you for reigniting this hope in me–a hope that He is still at work in me, that His purposes are GOOD for me (and even abundant! ), that He can and is reawakening in me (through your writing) that desire to look like Him. All I need is that desire. He will do the rest, as I “just sit here,” like you said (which, ironically, has been about all I have physically been up to doing most the time over these past several years!). I need to grasp more deeply that He is going about His work and fulfilling His purposes in me, even if I can’t seem to see them yet. Sometimes it’s hard to want to look like Jesus more than to just want out, you know! But thinking about this whole refinement process restores my commitment to staying in the crucible with a new attitude. One of hope–the hope that Jesus IS, indeed, making me into something beautiful, not just something broken! Will be printing this out and needing to reread and meditate on it over and over in the days ahead, I’m sure! THANK YOU SO MUCH!! Thank you for sharing your heart, dear Bonnie. What an encouragement you are to me. Even as I read your words, my heart echoed many similar feelings. It is so very difficult as we walk through long seasons of trials when we do feel so beaten down to keep in mind that there is some good in our Refiner’s mind. You are already such a beautiful soul, even in your brokenness. You will be a splendid sight in heaven one day! Absolutely wonderfully put! The Holy Spirit is definitely at work in you! Thank you for sharing these intimate feelings with us all. God is good all the time! Exceedingly, abundantly, beyond what we can fathom!